It still mystifies me why Next Train Indicators at tube stations perform so very differently. At Bow Road, for example, we've only ever had one minute's advance warning of the next westbound train, and the second train is never mentioned. Mile End, meanwhile, gets up to six minutes advance warning of up to three trains. Why should passengers at two consecutive platforms get such completely different information? The main problem is the hotchpotch of legacy systems that make up London's subsurface signalling, some of which date back to the 1920s. There are major plans to replace the lot, especially the really flaky sections, but it'll be years until the full upgrade's complete. In the meantime we get to make do with minimal information at certain stations, and rather more at others. So I've been on a tour of the Hammersmith & City line to see how good or bad its Next Train Indicators are. They're certainly a mixed bunch. Most look like one of the four designs pictured here (which I've numbered so we can keep track). First up is an older two-line version (Type 1), and below that a chunkier three-line box (Type 2). The newest indicators are rather sleeker (Type 3 and Type 4), and more usually seen on the deep level lines. Sorry, they don't all photograph very well. Meanwhile Edgware Road struggles on with some vile red LED display, and one station functions with the aid of a 40 year-old lightbox. There is no consistency here, no consistency at all. I started at Barking and travelled in to Aldgate East, then switched ends to Hammersmith and rode back. I stood on each platform waiting to answer two questions: "How many trains does this Next Train Indicator display?" (it's invariably 1 or 3) and "How much advance warning does it give?" The latter's quite a difficult question to answer, because you need to watch for the moment when a previously invisible train suddenly appears on the display. The flow of trains doesn't always make it easy to do this, but I hung around long enough on each platform to confirm the maximum. Barking Type 4 3 8 mins Only 1 minute's notice is given for H&C trains (which start out as "Check Front of Train"). East Ham Type 4 3 2 mins A relatively recent replacement for an old (obsolete) lightbox. Upton Park lightbox 1 3 mins The oldest NTI on the line, which still refers to the Metropolitan line, not the H&C. See below. Plaistow Type 2 1 3 mins Only the next train is shown, and no number of minutes is given. West Ham Type 3 1 1 min The next train is already in sight before it appears on the display. Bromley-by-Bow Type 2 1 2 mins Only the next train is shown, and no number of minutes is given. Bow Road Type 2 nil nil The NTI has been out of service for months (but used to give only 1 minute's notice). Mile End Type 2 3 5 mins Two smaller boards are positioned at the other end of the platform. Stepney Green Type 1 3 6 mins The second oldest NTI on this stretch of the line (and one of the clearest). Whitechapel Type 4 1 1 min While rebuilding works continue, these are positioned opposite the entrance, not on the platform. Aldgate East Type 2 1 1 min Only the next train is shown, and no number of minutes is given. Allow me to pop back to Upton Park, which boasts an adorable lightbox indicator on each platform. Eastbound the destination of the next train lights up, be that Barking, Dagenham East or Upminster. But the westbound service is more complicated, so this lightbox has only two options. One says DISTRICT LINE via EMBANKMENT & VICTORIA, which for District line trains is true. But the other says METROPOLITAN via LIVERPOOL STREET & KING'S CROSS, which is false, because the Metropolitan line hasn't served this station since 1990 when the Hammersmith & City line was branded. What's more, even taking this mislabelling into account the wrong line frequently flashes up. I watched two Hammersmith & City line trains enter the platform announced as District, and a District line train enter the platform announced as Metropolitan. 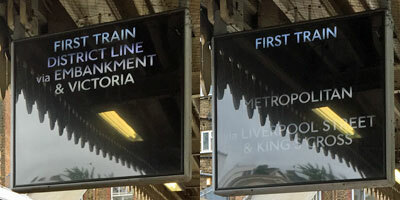 Upton Park's Next Train Indicator is doubly wrong, being both out-of date and inaccurate, making it entirely unfit for purpose. I'd hesitate to remove this heritage classic but, given that it's been displaying incorrect information for 26 years, isn't it about time somebody did something with it? Hammersmith Type 4 nil nil The display merely announces the next platform, eg "Next train is from Platform 1". → Royal Oak - nil nil There are no functioning Next Train Indicators at these seven stations. Paddington Type 4 3 13 mins Excellent advance warning (but westbound, no information at all). Edgware Road ancient 1 ¼ min Barely any advance warning at all. The signage here is old, faint and atrocious. Baker Street Type 1 3 1 min On one side a central strip has blacked out (and so reads "Circle line via l ool Street"). Great Portland St Type 2 3 1 min With only a 1 minute advance warning, it's rare to see two trains on the board, let alone three. Euston Square Type 1 3 3 mins In the opposite direction, westbound, over 10 minutes advance warning is given. St Pancras Type 3 4 5 mins Next trains are also announced by a semi-intelligible automated female voice. Farringdon Type 2 3 8 mins Later trains to termini not on the board are intermittently shown. Barbican Type 1 nil nil The Next Train Indicator is currently out of service (but used to give up to 8 minutes notice). Moorgate Type 1 3 9 mins For some unexplained reason, all the Next Train destinations are in capital letters. Liverpool Street Type 1 3 11 mins Provides all necessary information (but is hard to see...). 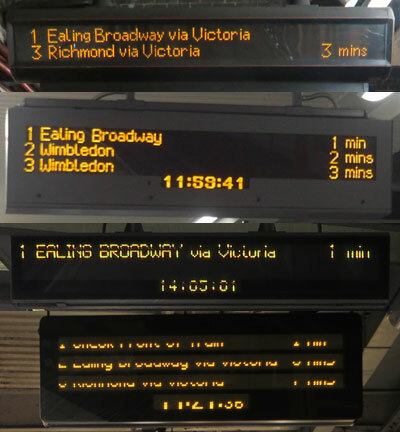 Like I said, the Next Train Indicators on the Hammersmith and City line are a motley and entirely inconsistent bunch. What information passengers see is a complicated mix of how good the signalling is, how far past a junction the station is, and when the box was last replaced. We get by, it's not difficult to wait for a train, but neither is this the quality of service we expect on deep tube lines, the Overground or the DLR. Meanwhile if you whip your phone out and open up an app, a wi-fi connection often reveals precisely what's on its way and when. And TfL surely know where all their trains are, it's just that they haven't got round to telling us yet. It may be 2022 before subsurface resignalling is complete, so don't expect to see consistent improvements any time soon. In the meantime it's often easier to discover when the next ten buses are due (above ground) than the next one train (below).